Canadian Pacific is another Class I railroad that provides web-based tools for rail shippers and receivers to track their shipments. They package their railcar tracking tools into what is called Customer Station. You can bill a shipment, order railcars, manage shipments (railcar orders, diversions, placements, releases, demurrage, freight claims / issues), and pay for a shipment here, but this article focuses on the trace features. If you have been thinking about using CP’s rail shipment tracing tools or you have been using just a small part of it and would like to learn more about what it can do, please read on. To sign up for CP Customer Station, take a look at this article, which explains how to sign up for the Class I railroad track & trace tools. With the Quick Trace feature, available on the Home page, you can paste or enter up to 1,000 railcar IDs separated by a space or a comma. Columns (fields) may be removed/added/re-ordered after the results display; data may be sorted by one column, but these changes will not persist to the next trace. If you want to keep these changes, you will need to create a Saved Report (see Custom Reports below). The results will display events while the railcar is on another railroad as long as CP is in the route for that shipment. The View column is useful for those who have facilities served by CP; it will indicate whether the railcar is in the pipeline (en route), in the serving area or at the facility. The More Info column includes icons to display additional information such as waybill, trip plan, customs or to log a problem with CP. Available columns include: Equipment ID, L/E, Location, Event Code, Event Description, Date/Time, Train/Track/Carrier, Position, Destination, ETI, ETA, Waybill (number), Content, Class Code, Car Code, Shipper, Consignee, Care Of, STCC, Previous STCC, Status, View, More Info. Results may be exported to Excel (CSV). You can copy railcar IDs from a column in Excel and they will be pasted properly for a trace without modification. How to get there: When you first login to Customer Station, you will see it in the middle right of the page. It is the same as the Home page. Quick Trace, Saved Reports and Trip Plan will show sighting events on railroads other than CP as long as the events are part of a shipment where CP is in the route. There isn’t a feature where you can request farther back than the beginning of the current shipment; you can do that by viewing the Trip Plan of the current shipment (see Trip Plans below). ETAs to final destination were provided for most of my shipments whether they were on the CP or another railroad. There is a column titled ETI, which means estimated time of interchange. When you run the Quick Trace or a Saved Report (see Custom Reports section below), on the far right of results, there is a “More Info” link that will reveal menus to the waybill, trip plan and customs information (if available). The complete history will be provided for the shipment to date which will be indicated as “Actual”. Only the CP portion of the trip will include planned events. If the trip is not finished, but the remaining portion is on another railroad, then you will only see the actual history up to the latest sighting event and any planned events that are on CP as shown below. The records may be exported to CSV/Excel. There is no place where you can enter a train ID for tracing. You can save and schedule delivery of multiple traces filtered by either a list of railcar IDs (up to 1,000) or parameters such as Origin, Destination, Commodity, Load/Empty. Columns can hidden / displayed, and reordered. Data can be sorted by 1 column, either ascending or descending. The columns that are available, which are the same as those in the Quick Trace feature (mentioned above), have been greatly increased since the last review. The email delivery is only once per day and simply to the email address associated with the online account. How to get there: From the Home page, click on the Carload Tools > Trace Equipment menu or enjoy the new inclusion of the Saved Reports section on the Home page to Create a new report, Edit, or Run an existing report. As mentioned above, from Saved Reports (Carload Tools > Trace Equipment menu) feature, you can save a report and then schedule it to go out once per day on any / all days of the week to just the email that is listed in the account profile. You can schedule up to 20 reports. There is no feature that will display the locations of rail shipments on a map. The Transit Time Report will show the time it took for the railcar to move on the CP-only segment: from when CP receives a railcar at origin or from another railroad to when CP delivers a railcar to the customer or another railroad in the route. A nice option is the ability to compare the transit performance between two time periods. You may also filter to just show loads or empties. The results may be exported to CSV/Excel or PDF. You won’t see any dwell (loading / unloading) time here though; if you are served by CP, you will be able to get that information from the Carload Tools > View Local Event History feature. 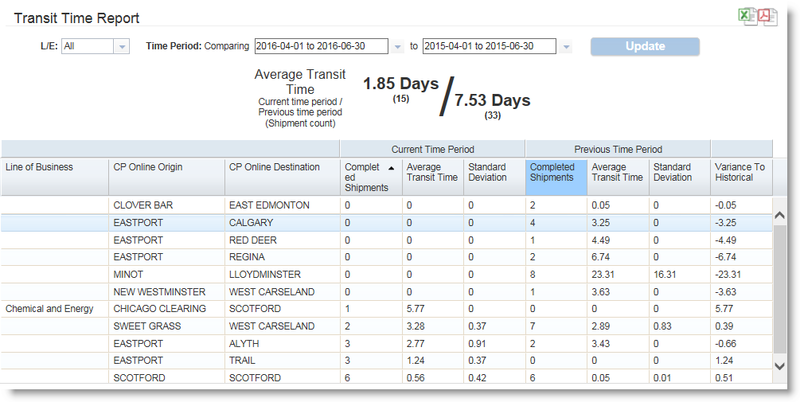 How to get there: Click on the Carload Tools > Transit Time Report menu. Very good. I didn’t notice any significant delays. The online help, accessed by clicking the Help link at the bottom left of each page, is very good. There are plenty of screen shots and good descriptions of each feature. The telephone support was friendly and helpful. I hope that you have found this article useful. Please share any experiences, tips, or tricks that you have come up with on the CP Customer Station site. How much money will they save me?